Snow dominated the tail end of the week and the first half of the weekend. The Thursday clubrun and Track session was cancelled for safety reasons but lots of members took to the trails for stunning snow runs. The snow also affected many Parkruns on Saturday morning with both Bracknell and Rushmoor events cancelled. Frimley Lodge made a late decision on Friday afternoon to go ahead and as a result attracted a sizeable field including twelve Sandhurst Joggers. Bracknell regular Charlie St Aubyn was first member to finish in a time only 15 seconds outside his best on the course despite the snow! Kate Parker completed her first run at the venue. Limited Parkrun Tourism this week as you’d expect but still some diverse locations. George Green made the short trip to Woodley one of the few other local venues in action. I collected a ‘U’ in the Parkrun Alphabet at the easily accessible from the M4 Upton Court while further afield Kevin Forster ran at Dungloe in Ireland. Award for the furthest trip to Parkrun goes to Simon and Anne Whillis who traveled all the way to Rotorua in New Zealand for the Puarenga Parkrun where they will have traded snow for the smell of rotten eggs. Richard Boese took on the Phoenix Spring Marathon on a course along the Thames between Sunbury and Hampton finishing in 4:48:05 to claim 46th position. 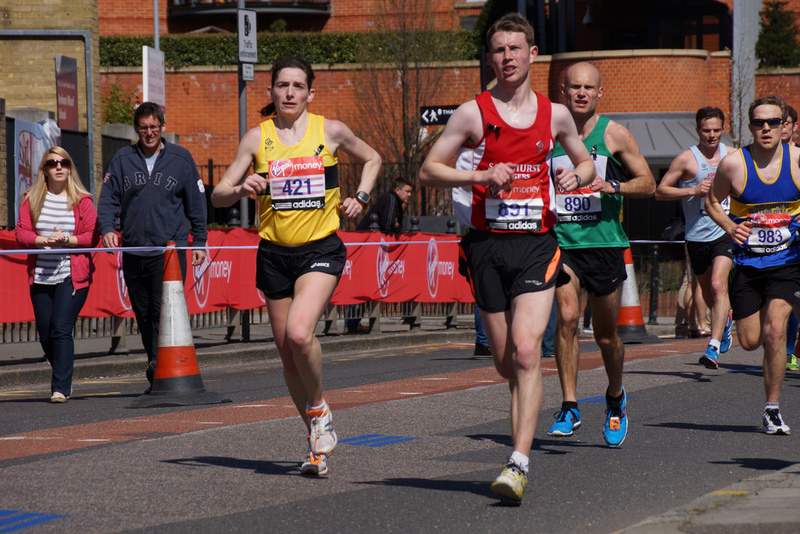 Sunday saw the Big Half; a new half marathon event held on a sightseeing course around London, starting near Tower Bridge the course looped out to Canary Wharf before heading south of the river to finish adjacent to the Cutty Sark. We had a trio of members in action; Nigel Evans and Claire Rowse and John King. Finishing in 1:47:49, 1:47:53 and 2:07:23 respectively. Claire’s result was a 5th PB in as many half marathons and Nigel came within a minute of the time he set at his last half; the Thorpe Half Marathon. Also within the M25, Krzysztof Zielinski ran well at the River Thames Half Marathon finishing in 1:30:43 to take 35th position. The course almost retraced Richard Boese’s marathon of the preceding day starting in Walton on Thames, following the river to Hampton Court before returning to the start. Monday: Patrick is back from Tokyo so will be leading the Monday night chatfest leaving Sandhurst Sports Centre at 7:30pm and covering approx. 6 miles. This is one of the most sociable runs of the week and a great opportunity to catch up with friends or discuss the preceding weekend. Saturday: Many members will line up at 9am at the numerous Parkrun around our area and further afield. If you haven’t ran a Parkrun they are a great way to start the weekend, either running at a sociable pace or using for speedwork. More details can be found at the Parkrun website http://www.parkrun.org.uk/ And don’t forget your barcode! Also if you are training for a spring marathon you can use the Facebook group to find company for those long runs.